Although the female praying mantis is known for devouring the male's head during mating, the fact is that this cannibalism occurs only rarely and only among a few species. Praying mantises (Hierodula patellifera) belongs to the order Mantodea, in 15 families and 2,400 known species. 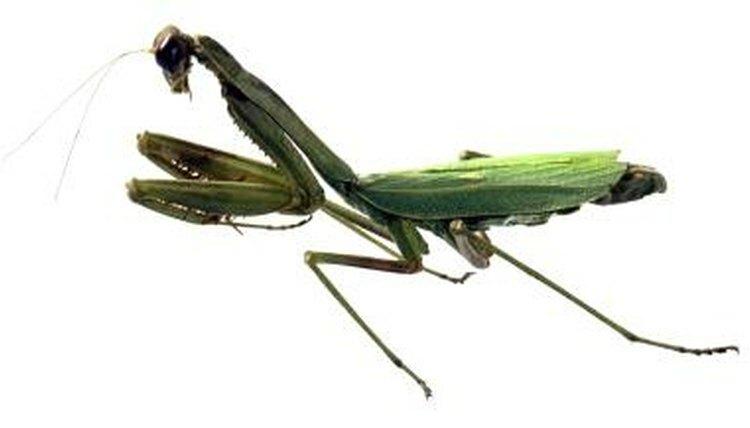 To mate, the male mantis jumps on the back of the larger female. Occasionally a female specimen will turn her head around 180 degrees and eat the male's head during copulation. PBS.org says this allows the male to be less inhibited; he continues to copulate after his head is removed. According to the Amateur Entomologists' Society, sexual cannibalism with mantids happens less frequently in the wild than when they're observed in artificial settings. After mating, the female will eat and grow fat before laying egg cases or oothecae, frothy masses that resemble honeycombs and harden to protect the 12 to 400 eggs inside. She will lay several oothecae on branches above the ground. Praying mantis eggs hatch after three to six months; the young hang from their oothecae until their skins harden. These nymphs have incomplete metamorphosis, which means they look like tiny adults. Their wings will gradually form, appearing full after their final molt. As adults they'll live about a year.